The much talked about BlueSpoon from Nextlink arrived in a quite large box for transport of the smallest (45x25x25mm) Bluetooth headset on the marked. In the box, I found the BlueSpoon, charging cradle, power supply, CD-ROM with interactive user manual, a printed user manual and three extra soft springs. As with most rechargeable devices, the manual advice you to charge the BlueSpoon to maximum before use. After 90 minutes, the unit was fully charged and ready for testing. Before reading the manual I tried to insert the BlueSpoon in the ear, but without success. It would fit, but it did not stay without holding it by hand. The printed manual wasn't very good in explaining how I should insert the BlueSpoon in the ear, but the enclosed CD provided an animated sequence, which illustrated how to do this. After using the BlueSpoon for one week, I'm still not confidence on how to insert the unit quickly into the ear. It's fine when making calls, but takes too much time to attach when receiving them. This is probably a practice thing. With more usage, I would probably master this better. I manage to insert the BlueSpoon whit one hand, but you can't start talking before it's completely attached. This is because you must click on both the black buttons when answering a call, and it's difficult to do this at the same time you attach the unit. The two buttons are placed on the "outside" of the unit, which means that to adjust the volume or answering calls you need to press the BlueSpoon against your ear. The first times I used the BlueSpoon, it was a pain to click the buttons, but with a little practice I manage to do this without hurting my ear. I would have preffered that the buttons would be placed elsewhere on the unit. Maybe locating them on both sides would have been better. I'm used to the HBH-15, which is very easy to attach to the ear. I'm also used to wearing all kinds of headset in the left ear, but the BlueSpoon test sample was for right ear usage only. It is not possible to use it in the left ear. The backside is "one-piece" with an "ear-lock", that can be exchanged, but you can't "flip it" over. Nextlink have done a research on the left/right ear usage, and found that 85% use the right ear for headsets. Too bad for me as I haven't heard if Nextlink will produce a left ear version later. 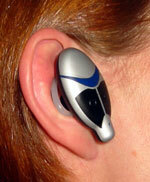 The package includes 4 soft springs, which is the part of the BlueSpoon that keeps the unit fixed in your ear. They come in two versions. Two springs defined as hard, and two softer. These are easily changeable but are something you only do once. The BlueSpoon was obviously made with my ear in mind. It fit and stays without any problems. But I let other people try the unit for a short time, and one them was not able to attach it properly. The person's shape of the ear was not an "optimal" fastening bracket for a BlueSpoon. I like her ear, but the BlueSpoon didn't. For most people I'll guess the BlueSpoon fits fine, but if you are thinking of buying one and have the opportunity to try one first, I think you should. I am not quite satisfied with the sound quality of the BlueSpoon. Well.. I am, but my callers are not. I had no problem hearing the caller, so for me this was not a problem. But the caller on the other end didn't hear me very well. This is probably because the microphone is very sensitive for background noise. With normal background noise (radio in the background at normal listening volume) most callers had problems hearing what I said. Adjusting the volume control was supposed to be an easy task, but I didn't manage to change it at first. The manual explains that you just have to press the right button a couple of times. First I couldn't hear any difference in the volume, but after pressing one of the buttons a lot of times, the volume adjusted. After I managed to turn up the volume a little louder I found the listening quality very good. The drawback of putting a unit inside your ear is that you don't hear the surrounding sounds. Depending on where you use it (noisy environment), this could also be an advantage. The standby- and talk time is impressive on this product. The BlueSpoon didn't need a recharge before a week had passed. Impressive! I guess the claimed 200 hours standby time is correct. Because the BlueSpoon blinks every 20 seconds to indicate the battery status, I found it is difficult to know whether the battery needed charging or not. Didn't see the read low battery warning before it was too late. I.e. the battery was empty when I found out. I experienced no problem with paring the BlueSpoon with a T68 or T39. 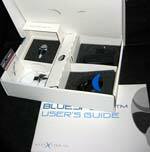 Just like any other Bluetooth headsets, it is easy to pair the BlueSpoon with a phone. I would like the ability to change the 4 number default password to something else. The manual didn't explain how to change the password. I found this strange. The advantage of wearing such light unit as the BlueSpoon is that you can do quick head movements without loosing the unit. It stays. Even running shouldn't be a problem. Talk-time: 4 hours up to 5 hours 45 min.